My favorite street names can be found in the Indian Head Acres neighborhood in central Tallahassee. Names like "Heechee Nene" and "Toochin Nene" are there to remind you that this is Seminole Territory, and these Seminole Indian Trails are a great place to live. 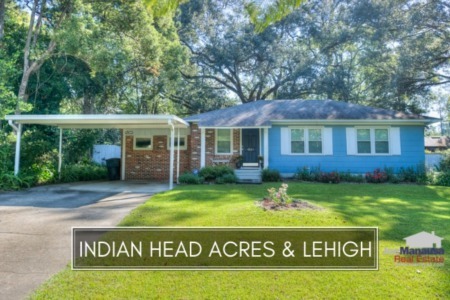 You will find Indian Head Acres and it's southern neighbor on the east side of Magnolia Drive, just south of Apalachee Parkway. Homes here were constructed from the 1940s to recent times, so this is one part of town where you really have to qualify the "effective age" of a home based upon is current level of renovation or modernization. Recent buyers have told us they love these two neighborhoods due to their proximity to shopping, nightlife, Starbucks and the new Cascades Park Amphitheater. You hardly need a car if you choose to live in Lehigh or Indian Head Acres. 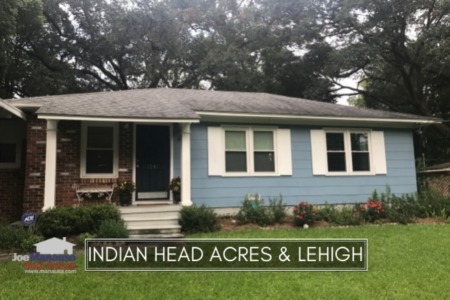 It is important to note that the narrative contained below is for sales through December for all years, but the graphs and the closed sales table will be continuously updated into the future (meaning bookmark this page if you always want to know the current status of homes in Indian Head Acres and Lehigh). Average home prices in Indian Head Acres and Lehigh were 4% lower in 2015 than they were in 2014. This means that buyers are spending 25% less for a home than they were at the peak of the market in 2007. If the new mortgage forgiveness debt relief extension does not bring out new short sales, then I expect Lehigh and Indian Head Acres average home prices to begin to rise as fewer distressed properties will remain to be purchased. Home sales activity fell in 2015, which was not so surprising after the big year posted in 2014. Expect to see solid sales here for the foreseeable future. Average home values in Indian Head Acres fell in 2015 after two years good years of growth. The average value of a home sold in Indian Head Acres was $93 per square foot. This is down 24% since the market peak was reached in 2007, and up 13% since the bottom in 2012. This is a sign that the distressed properties continue to hold values back. The 30 home sales in 2015 averaged 1,505 square feet. I hope you enjoyed our January 2016 update on home sales in Indian Head Acres and Lehigh, please feel free to drop me a note if you have questions not covered in this report.